So much is happening right now. The moment we feel that we have gotten our footing from one energy event, another one is on its heels. The end of July and the month of August are jammed packed with amazing events that have the ability to really shake things up. The is all happening to push us beyond our perceived limits and to clear out all that cannot be held in the higher frequencies. 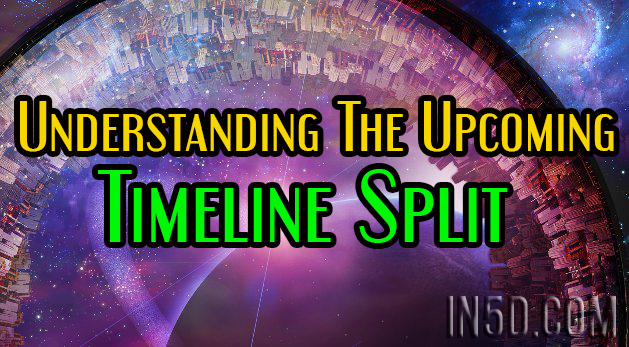 As some of my clients have expressed concerns about the timeline split, I decided to talk with my Ascension team about the upcoming timeline split in a question and answer format. Team: The timeline split is most auspicious. It is the defining point. It is the convergence of frequencies all geared towards the same outcome – mass ascension of the human population. Me: Last September, we as a collective choose an accelerated timeline. Is this a byproduct of this choice? Team: Yes, once the accelerated timeline was chosen, all that took place energetically was to prepare each person for the timeline split. Me: Will the timeline split happen in an instant? Team: No, it has already begun and will conclude after the eclipse season. Me: Will people be aware that the shift has taken place? Team: Some will yes. However, many will not. They will simply look back upon this time as the moment all began to change. Me: Will there be those that choose not to ascend? Team: Yes, though you must understand that there are levels to what one considers ascending. The basic definition is for the souls to hold within themselves a frequency of no lower than the lowest level of fifth-dimensional frequency. This will be confusing for many as they have been led to believe that it will be a utopia in an instant. Instead of a gateway for one to experience further growth without the outside influence of negativity. There will be those that choose to reach the highest levels of frequency within themselves and those that will be content to have made it through the threshold. Me: So after the convergence, will all negativity be gone? Team: No, each person will have to work through the beliefs that have led to the creation of what you see in the collective. What will change is the requirement for duality to be part of the experience. No longer will one have to learn through suffering and sacrifice. However, there will be those that will continue these dynamics within themselves until the programming is sufficiently rewritten. In order to move from this energetic pattern, one must remove the judgments of self and others, forgive all, and allow joy to permeate all parts of their being. Me: Will those that are not choosing to ascend at this time still be on earth? Team: For a time, yes. For some, you will find that they naturally gravitate away from you and your creation of reality. Some will choose to leave their form, but this will also be true for some who are choosing Ascension in this lifetime. Not all will choose to stay in form once they have completed what their soul intended. Others will still interact with you helping you to continue learning and growing as they fulfill their soul contracts. All of these interactions will settle over the next 3 years. Me: What is taking place this August with all the huge energy events? Team: These are choice points if you will. Each event an opportunity for all of one’s lower timelines to collapse within. This is so that all of one’s energy will be focused on moving themselves and the collective as a whole forward. It is a space where all the higher frequencies will converge helping to create new potential realities of each person. This convergence will not bring about an instant utopia as there is still much work to be done to clear the disharmony within the collective, but it is a stepping stone where greater assistance will be given. Many layers of the veil will fall away for those who are ready. Me: Will this lead to disclosure? Team: Not in the sense you are referring to. It will lead to the disclosure of one’s true self as all the false belief structures will become more apparent. As more of the collective discovers the hidden truths, it will pave the way for clearer galactic interaction. Me: What else do we need to know about this timeline split? Team: It will be a boost to those that hold the higher energies. There will be greater ease in their form as all around will begin to work together. It will feel be as if unseen support teams have been added. For some, the timeline bifurcation will bring even greater clarity to where dysfunction and inauthenticity have been part of their experience. For those still asleep, the timeline split will begin their awakening. Me: So even those that are not awake yet may choose which path to take? Ascension or not? Team: Absolutely, the choice is made at a soul level, prior to incarnating. Though there are some that chose to Ascend but have since decided to obtain more growth within duality. Likewise, there are those that chose initially not to ascend but have found that they were up for the task. Each person’s soul chooses the best path, so if one chooses not to ascend there is nothing to be done but to honor that experience. When one awakens is more of a human choice, which is why some take longer than others. The more deeply entrenched in programming one is, the more the human must be shaken from their sleep. Me: I had to be shaken quite a few times…. Team: Yes, some need to shaken more abruptly than others (laughing). Yet, know that even in the deepest sleep one is learning and experiencing for their soul growth. There is much to appreciate in learning who you are not as there is in learning who you are. Me: Whenever there is talk of people choosing paths – it brings so much fear. People are afraid that loved ones won’t make it. The fear reminds me of the belief in the Christian rapture that in one moment people will disappear. Team: There needs to be no fear. This is the time of Ascension. Those that are here now are here to ascend with the planet or to simply be part of the experience by providing contractual experiences that benefit the growth of the soul. While there will be a falling away of people that no longer match the frequency you hold, there will not be a mass exodus from the earth in a single moment. Even those that fall away from you may still be choosing to ascend, yet at a higher or lower frequency within the timeline split. Allow these souls to walk their path, while you walk yours. Knowing each is having the perfect experience for their soul. There is not one path one must walk on the journey to remembering who you are. Me: How can people prepare for this timeline shift? Team: Examining one’s beliefs, stories and expectations are important. These are the things that will cause one to experience greater disharmony in the higher frequencies. Look at how one has limited themselves in body, mind, and spirit and then stretch beyond those limitations. We ask that each person works on accepting all that they are and forgive and love what they have deemed unacceptable within themselves and others. Opening one’s heart through love, gratitude, and forgiveness of all will allow the energies to flow with greater ease through you. Each person must come to understand that their potential is limitless. If one is able to see themselves as we see you, then you will fully understand your magnificence and the bravery it has taken to be part of this experiment. Team: It is our pleasure.